Can the creativity of historical artists be measured? Obviously, that's been on my mind this past week. The "Michelangelo-vs-Van-Gogh" discussion gave me a few ideas. For instance, if we define creativity as "the ability to organize raw materials and undeveloped ideas into new and meaningful products", then perhaps we can find a way to measure a "product's" creative value in terms of how new (novel, original) and meaningful (enduring, influential) it is. Perhaps we could assign a qualitative number (from 1 to 10) to each of these categories, multiply them, and arrive at a quotient between 1 and 100 (the higher the number, the greater the creativity of the product). In that way we could assign a value to the creativity of a product. 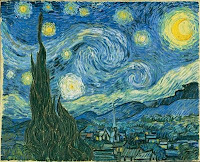 For example, let's consider Vincent Van Gogh's painting, "Starry Night." How does it rank with regard to newness? Well, Van Gogh was influenced by Japanese woodblock prints, and he associated with several notable artists of his time, yet his work was highly original. In fact, Van Gogh's art was never well received during his life time, which, arguably is a testament to it's uniqueness. It often takes time for the populace to accept new ideas. This was the case with Van Gogh, so let's give him a 9 for newness. And how about meaningfulness? Well, this Starry Night was created in 1889, so it has endured only a short period in the history of art, but since then it has become one of the most popular images of all time. It's young, but has connected with a lot of people, so let's give it an 8. So, 9 x 8 gives us a quotient of 72. What do you think? What works of art might receive a 100? In addition to analyzing the creativity of a product, we would also want to consider the creativity of an individual. Is there such thing as a "creativity quotient"? What designates a person as creative? And what makes one person more creative than others? If we identify those traits, then perhaps they could be measured independently and help arrive at a quotient. We might consider the quantity of products that an individual creates during his/her lifetime, the average quality of those products, and the breadth of that person's creativity achievements (i.e. DaVinci's interest in art, science, engineering, etc.). What other measurable traits might be considered? I should probably explain my current obsession with creativometry (did I just coin a new word and does it work?). As I mentioned in my last post, I teach a class called History of Art and Science, and at the root of that class is creativity. And as I have taught that class, it has become quite obvious that--although I believe we're all born with it--not every individual develops creativity in the same way or to the same extent. I don't necessarily believe that creativity can truly be measured, however I would like to give my students some sort of tool they can use to compare and contrast creative individuals, products, and periods throughout history. So, I hope you'll let me know what you think of these ideas. Thanks. Who is more creative, an artist like Michelangelo, whose greatest works were commissioned by the Catholic church, or an artist like Van Gogh, whose art was inspired only by his own observations and imagination? How do we define and measure creativity in a way that lets us compare these artists? What system of metrics can we use? There you go. Please, leave your comments below and help start a discussion. Thanks.